Our wrangler for this blog hop is Maureen Aisling Duffy-Boose. She asked us to get creative and draw the card we'd choose for the harvest festival of Mabon. 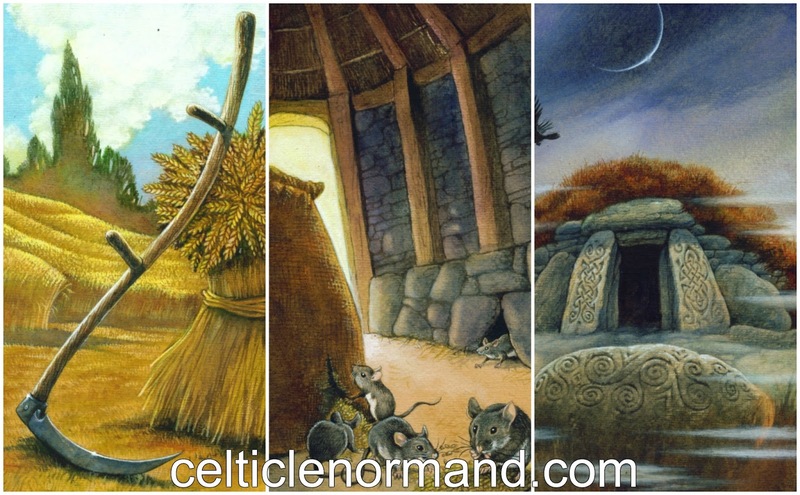 Now, I've already posted about the card I created to represent this in the Celtic Lenormand: the Meadow (Garden). And as this is the Celtic Lenormand blog, I didn't feel I could just draw another card, especially as my artistic skills are limited, hence enrolling the fabulous Will Worthington to paint the deck in the first place! Instead, I thought I could get creative by collaging this card with others I would consider related to it, especially in terms of this turn of the Wheel of the Year. When I was at school, I remember us bringing in tins and packages of dried food for this season, as part of the Harvest Festival. These were then donated to those in need - a lovely, modern take on sharing the fruits of the harvest. This festival, then, is not just about the harvest itself, but about the sharing of it, the sense of community. That is represented in the Meadow card, where food is laid out on blankets in a meadow, ready for the entire village to share, perhaps also with people from the neighbouring lands. That element of gifting would be represented by the Flowers (Bouquet) card. Often, it is charitable institutions that oversee delivering the harvest fruits to those in need: Flowers, Meadow and Hill Fort (Tower). Another aspect of this festival is the need to be organised about it: there's no point to gathering the fruits of the harvest if they then go to waste - either rotting where we store them, or never reaching the people who need them. So, we might pair the Meadow and the Flowers with the Anchor for doing the work necessary to preserve and store them, and/or with the Bear for the kind of person who would be good at that kind of organisational work. And we definitely wouldn't want the Mice getting into our stores! Perhaps, if this were a spell, we might specify an end to the Mice - adding the Coffin to box them in, or cutting them away with the Scythe... Thieves will be sliced up and buried! Oh I love how you string the cards together in a story about the harvest, makes it easy for people like me who don't understand Lenormand, actually now understand some of the meanings of these cards. I like the "get rid of mice" spell :) Images are powerful in that regard. 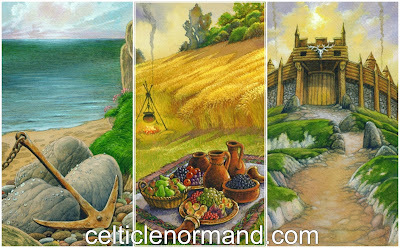 This was so helpful in terms of learning the Celtic Lenormand cards! Thank you!